Back in October, Collider was invited to Illumination Entertainment in Santa Monica, in order to preview some footage of Dr. Seuss’ The Lorax. As a lifelong fan of the Dr. Seuss stories, and some of my earliest memories being connected to them, I was excited to get a glimpse of what audiences will get to see, when the film opens in theaters on March 2nd. In an office surrounded by character merchandise and sculptures, it’s easy to see that producer Chris Meledandri is as much of a fan of the Dr. Seuss legacy as the audiences who love the work, generation after generation. Something about the stories of Dr. Seuss makes the reader or viewer feel like a kid again, and makes kids feel a sense of wonder, and The Lorax will clearly be no exception. 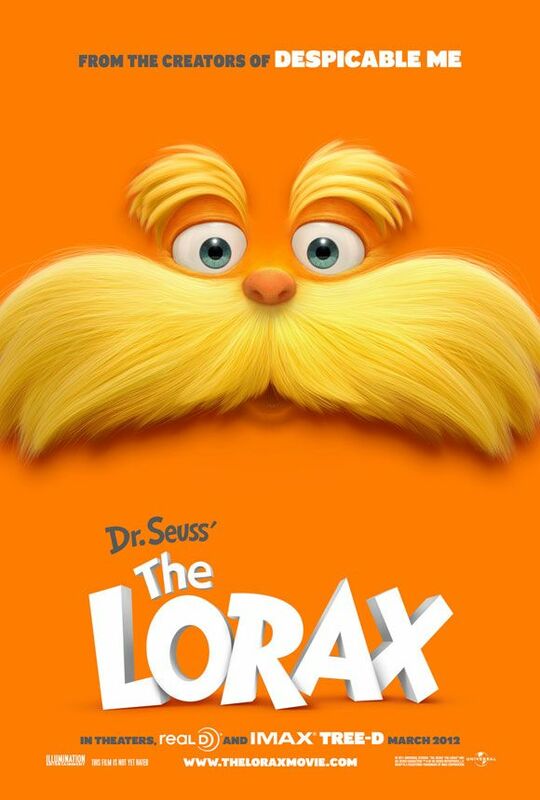 In case you’re not familiar with the story of The Lorax, the 3D-CG feature is an adaptation of the classic tale of a forest creature who shares the enduring power of hope. As a 12-year-old boy goes on a journey in search of the one thing that will enable him to win the affection of the girl of his dreams, he discovers the story of the grumpy yet charming creature who fights to protect his world. Hit the jump for 10 things to know about The Lorax, our interview with Chris Meledandri, and our thoughts on the footage we saw. Once we were in the editing room, we got to see a collection of scenes in various stages of animation, but it was easy to imagine how beautiful the finished product will look. We got to see the look of both the young Ted (voiced by Zac Efron) and his crush Audrey (voiced by Taylor Swift), who paints trees so vividly that it prompts his quest to find a real one. Described as having tufts softer than silk and a smell of butterfly milk, it is easy to see why someone would become so fascinated with them. With the vibrant, lush visuals of what things used to look like, contrasted with the bleak land outside of town, the film is clearly a character-based story of great scope, with laughs and tears, in all the right places. Producer Chris Meledandri assembled most of the same team that did Despicable Me to take on the challenge of adapting the work of Theodor Geisel for The Lorax and bringing the serious themes to life in a relatable way. In order to expand the story past what’s in the book, they looked at what happened before the book starts and after the book ends. The production timeline for Illumination Entertainment animated features is about 18 months, with all of the pre-production storyboarding happening about nine months prior to that. The characters of Ted (voiced by Zac Efron) and Audrey (voiced by Taylor Swift) are named after Theodor Geisel, aka Dr. Seuss, and his widow. The story begins when a kid, who has a head-over-heals crush on his next door neighbor, sets off on a journey to find a real tree for her, in an artificial world. When they fleshed out the story of the young Once-ler, they made a choice to actually show him as a young man, keeping the iconic nature of the arms and eyes that readers are familiar with, but also bringing him to life. The 3D will not be intrusive, but rather was used to create a sense of isolation, exhilaration or hope, and will capitalize more on depth than gimmicks. Vegetation is generally very render-intensive, so a lot of time was spent on the visual development of the individual trees, as they ware so important to the story. Director Chris Renaud decided to choose actors older than their characters to voice the roles, just to get some more substance and acting in the voice, and not risk the voices changing during the recording process. The dialogue is not in rhyme, but there are moments where it felt like the rhyming was called for, so it emerges. Having now worked with Audrey Geisel for eight years, Chris Meledandri hopes their partnership will continue to make Dr. Seuss’ work extremely relevant for future generations with projects spotlighting his legacy, including a live-action telling of his life story, with Johnny Depp in the lead role. Question: What were the challenges in making The Lorax, as compared to the challenges you had with Despicable Me? CHRIS MELEDANDRI: The challenge of this movie is very different from the challenge with Despicable Me because the experience of doing an adaptation of a beloved work, and really any of [Theodor] Geisel’s work, presents a very, very different challenge. But, we basically have put together almost the same team that did Despicable Me, to take on that challenge. It’s the same writers, who also worked with me on Horton Hears a Who. The one exception is that the music is being done by John Powell. The differences really start with the challenge of doing an adaptation. At the core of the book is a story that has very serious themes, starting with how greed can seduce you into a place where you lose your sensitivity to the world around you and, in the case of this story, actually become destructive. Also, at the center of it is a story of redemption. The character of the Once-ler (voiced by Ed Helms) is ultimately a character who wants to undo that which he’s done. The challenge becomes taking a story that has these very important thematic elements and doing what Geisel did so well, which is to present the story in a way that is highly engaging, so that audiences come and enjoy it and are dazzled by the imagination, and then perhaps leave the encounter with the story somewhat influenced by the content. We’re making a movie that aspires to be highly entertaining, visually of great scope, exciting, and emotionally packed, but the core of it is undoubtedly this story. What’s exciting about that, for us, is that it allows us to go into terrain that isn’t just like the last five animated movies you’ve seen. It’s very much character-based, like Despicable Me, and the comedy comes from the personality of the characters. But, the storytelling and the experience of the movie has very distinct differences as well. How did you go about adapting such a short book into a full-length feature? It starts off as a character journey. This kid, has absolutely got a head-over-heels crush on his next door neighbor, who is about three or four years older than he is, and he’s a romantic. They live in a world which is a wonderfully artificial world. Nature has been taken out of it, just like nature has basically been drained from a city like Las Vegas, but everybody who goes there, loves it. Everything that you might desire that was natural, has been replaced by something that’s fake, and no one is complaining about it, except for this one girl, who he has a crush on, who is just fascinated with the idea of real trees. She paints these trees, and nobody else even thinks about them. That’s the circumstance that leads him to ask his grandmother, “Where can I find out about trees?,” and then he goes down this path. It’s very much based on what Geisel drew. How many changes did you make, in expanding the story? MELEDANDRI: There are a few changes that you’ll see. The old Once-ler is depicted in the movie as arms and eyes. There’s a story within the story, which is, “How did this get this way?” As we go into the story and we flesh out the story of the young Once-ler, we made a choice to actually see him as a character, as a young man. We keep the iconic nature of those arms and eyes, sticking out behind this wood, but when we go into the backstory, we bring him to life. What’s fun about it is that the more you read the book, the more clues you can find about where and how to expand. While not everything is based in the book – some is pure imagination – there are also things that are referred to in the book, that you never quite see. Did you name the Ted character (voiced by Zac Efron) after Theodor Geisel, and Audrey (voiced by Taylor Swift) after Audrey Geisel? How did you decide on the look of Audrey? MELEDANDRI: Audrey is one of my favorite human CG characters that I’ve seen. She’s just got some aura about her that really worked quite wonderfully. Why did you choose to do this in 3D? MELEDANDRI: The general feeling about 3D and CG-animation is that it is a very organic way to express 3D animation because the films are already being made dimensionally. From the outset, there is already a lot of thought going into the utilization of space. When you introduce the 3D aspect into it, obviously the artistic process focuses more on how you can stretch the utilization of that space to create an experience that is immersive, and how you can utilize the space to support the storytelling. I’d say the general feeling about how the team uses 3D here is that it tends not to be intrusive, but there are sequences where, absolutely, the space is used to create a sense of isolation, exhilaration or hope. I think it’s perfectly appropriate that some audience members want to see it in 2D and some audience members want to see it in 3D. But, what we have found, going from the first movie in 3D to now the second movie in 3D, and watching how the artists’ own abilities mature, in terms of how they’re thinking about that space, through all of the parts of the process, it is a very organic extension of this creative process. That’s not to say that some director may decide a movie should be more flat, and that’s fine. But, I’d say that the 3D expression of these films is something that feels quite appropriate to me. That additional focus is quite a dynamic one, watching it happen within the process. When it comes to utilizing 3D, do you capitalize on the depth, rather than focusing on tricks? MELEDANDRI: I think that what you find is that directors prefer to capitalize on the depth. They’re very cautious on what comes out of the screen, rightfully so. They’re concerned with popping you out of the movie, doing something that feels like a gimmick, or being intrusive. If I look at a sequence that is going to be quite dynamic in 3D, it’s also dynamic in 2D. Those tricks tend to be done more sparingly. The immersion in this world is of great value, but you’re going to get that in 2D as well. It would be interesting to hear what he would say about things, if he were alive, but he was always fairly contemporary in his thinking. He was thinking beyond the present. Just as an artist, he worked in sculpting. When we were starting Horton Hears A Who, we thought, “How do you take his very simple, flat-line drawings into three dimensions, and is that a good thing?” But then, you find that he made three-dimensional pieces. How much time did it take to make an individual tree for the forest? MELEDANDRI: I don’t have a smart way of translating that into man hours. What ends up happening is that they become extremely computing intensive. There’s a fairly long period of RND, where you’re going through trial and error to get a certain effect. That happens over the course of the visual development of the film, for many, many months. It’s one of the main projects. You identify what the major projects are within the film, where you’re not just basically calling upon things that have been done before, and the quality of those tree tufts are visually specific to this. There are a number of projects like that, that become research and development projects. Once they’re defined, they become rendering intensive and take a tremendous amount of rendering power. We had continually been expanding the render form, through the course of making Despicable, and then this film demanded an increase from there. Vegetation, in general, is very render-intensive, and when you get to something like that, it’s even more so. Is the overall development timeline for your films less than some of the other animation studios? MELEDANDRI: Certainly, on Despicable it was. Start to finish, from inception to completion of the film, it was a little over three years, and that was lightning fast. And that’s including the writing of the script. We got a head start here, on the writing of the script, because that was going on while Despicable was being made. Once we get into production time frames, as opposed to development time frames, we’re a little bit shorter, but not significantly. We’re still roughly making the movie in a production timeline of about 18 months, with pre-production being all of the storyboarding, about nine months prior to that. We’re basically using the same model that we used for Despicable, which allows us to achieve what I think is exceptional visual quality for a price that is an extremely smart way to be making movies today, so that every movie is not dependent on everybody in the universe going to see it, in order for you to be able to continue to make more movies. The goal is to sustain this process of bringing these people together to make movies. Can you talk about the choice of Danny DeVito and the importance of finding the right voice for The Lorax, as well as the other characters? MELEDANDRI: DeVito is a particularly good example of fairly specific qualities that he’s bringing to the character. The Lorax, as conceived and as described, is mossy and bossy. He’s got an edge to him. So, when we were thinking about actors to voice the character, we were thinking about actors who have the ability to be crusty and be a little irascible, but still find the place of emotional access, and can also put a sense of comedic quality to that. The first name that we talked about was Walter Matthau, who is deceased. It was that kind of embodiment of that grouchy guy, who you’re still charmed by. And, Danny DeVito has that quality. It’s funny, when you set out to cast kids, there’s a real challenge, at that age. First of all, their voices are at risk of changing overnight, which could be a production problem. Also, a lot of kids today, at that age group, are trained to be TV actors. You listen to hundreds of kids, and they all sound the same. They’re all pitched at the same place because that’s where the jobs are. (Director) Chris Renaud was very interested in thinking older, just to get some more substance and acting in the voice. Zac Efron has this boyish quality to him, and it came through in his voice. With each one, there’s a lot of discovery that happens. There are a lot of reasons that you’re drawn to them, and there’s a lot of discovery along the way. This phenomenon with Betty White is so wonderfully amazing. In a world where agism runs rampant, out of left field, all of a sudden, the country decides to celebrate Betty White and she becomes cool at 90. That’s remarkable. Just to have the movie be a beneficiary of her energy and that performance, it brings a lot to a role that ultimately becomes a very substantial role in the film. And, she’s Audrey Geisel’s favorite actress right now. She loves Betty White. How old is Audrey Geisel? MELEDANDRI: I don’t know exactly, but I’d say she’s well in her 80’s. Are the rhyming couplets that Dr. Seuss is known for consistent throughout the film? MELEDANDRI: It is not. It is sporadic in the film. The dialogue is not in rhyme, but there are moments where the rhyme just feels like it’s called for and emerges. So, it’s present, but it’s not consistently throughout all the dialogue. Do you feel that there’s a really timely message to this film, for younger audiences? MELEDANDRI: Yeah. When he started out, he was a political cartoonist first and he made the decision to write and illustrate for young thinkers because he realized that his political cartoons really didn’t change anybody’s mind. He was either preaching to the converted, or he was running up against walls. So, he realized that, if you want to have an impact on the way people think, he’d get a much bigger return on his artistic investment with a younger audience. That was the motivating factor for him to go from being very sophisticated, in terms of his presentation of ideas, to very imaginative, but still with a level of sophistication. I think that’s why these books are the ones that adults pull off the shelves so quickly. They do speak across generations. What are you looking to do with the live-action Dr. Seuss movie that you’re developing with Johnny Depp? MELEDANDRI: It will be a live-action story about Ted Geisel’s life and partnership, for Johnny to play Ted Geisel. When you keep digging into his life, you keep finding more and more things. There’s more that I don’t know than I do know. Every time we dive into it, we find some other little gem. Is Geisel’s widow supportive of the project, and the choice of Johnny Depp? MELEDANDRI: Oh, absolutely! She got a really bad rap on The Cat in the Hat. She was depicted as somebody who was trying to exploit her husband’s work. She is incredibly protective. The movie got over-merchandised and didn’t work out, but she is extremely protective. She was his second wife, and played a very different role in his life than his first wife, who was intricately involved in his entire career and the publishing, and all of that. But, she’s got a really acute sense of what the essence of the work is, and a very strong point of view about how to protect that. Without that, it just dissipates and rules start getting broken. It’s just inevitable. I think every great property that wants to endure needs somebody to be the keeper, in that way, and she plays that role. It’s a value that she’s giving to it. Is this going to be an ongoing relationship, as far as continuing to tell Dr. Seuss stories? MELEDANDRI: There are other things that Audrey and I are talking about. The combination of my feelings about his legacy and her comfort level, having now been working together for eight years, it just makes sense for both sides to continue to do this. With any great artist from the 20th Century, whose work lends itself to this medium, or the film medium, in any way, there’s an opportunity and a responsibility to secure that legacy for future generations. If you’re not actively working on it, a lot of other things come into the global consciousness and things can get lost. An objective of ours is to make sure that we do what we can do to make him extremely relevant for future generations because he was talking about things that were absolutely timeless.